It’s a rare thing to see a television show that dares to challenge the status quo of how stories are told and to explore new ways to bring stories to our lives. While “Black Mirror” has only given us seven episodes in its two seasons so far, each episode was an unbelievably bright star that shone light on how the evolution of technology can change our lives as individuals and as a society, in excitingly positive and terrifyingly negative ways at once. It brings me great pleasure to have an opportunity to speak with Gemma Kingsley who was in charge of defining and creating the screens that exposed the technology of “Black Mirror” in episodes such as “15 Million Merits”, “Be Right Back”, “The Entire History of You” and “White Christmas”. In this interview she talks about her career as a graphics designer and art director, the variety of productions she works on, and the ways to describe how technology can evolve in our lives without having that depiction overtaking the main story line. Gemma also dives deeper into the details of what went into creating the screens for each particular episode, as well as her thoughts on the pervasiveness of social media in our daily lives. 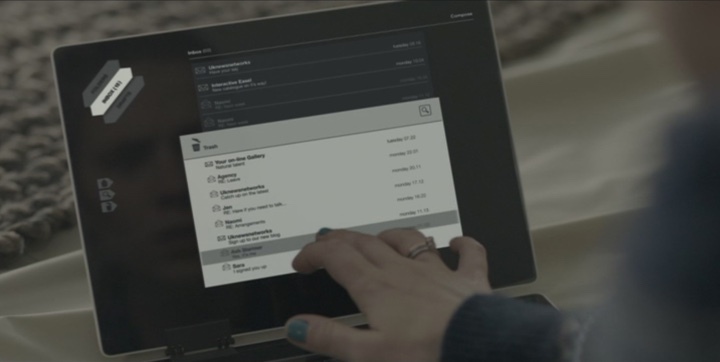 The screens of “White Christmas” episode of “Black Mirror”. Courtesy of Gemma Kingsley. Gemma: I do motion graphics, as well as art department graphics and art direction. I used to work at a TV news station doing motion graphics, and then I completed master of art in production design for film and television. After that one of my teachers offered me some work in the feature film world. I took that job, and from there continued working on various drama productions. Kirill: What do you do as a graphic artist on a feature production? Gemma: Sometimes I do motion graphics, especially if it’s a smaller production. On larger productions I usually do props, anything from designing tents and ship sails on a film like “Pan” to things like parchment letters for “Dracula”. On that movie they wanted the set to be a part of the story, with old wall murals from Romania. The production designer has asked me to design the wall murals into the sets of the monastery and the chapel and castle. If you look at the backgrounds of those sets, you can see the wall paintings and murals, and that’s what I did there. Kirill: When you talk with people and they ask you what you do for a living, are they surprised to hear that everything needs to be designed? Gemma: I find they are surprised at how much work goes into it. A lot of the time, especially with features, they don’t realize that copyright is a major issue. You can’t just take products and use them, especially if you’re talking about famous brands. You might approach a company to use a brand of theirs, but if the storyline doesn’t reflect well on it, the brand will simply say “No” because it puts their brand in a slightly negative light. So even though they would get marketing from having been seen in a big film, they usually say “No” unless it’s being shown in a very positive light. You usually have to make up a new brand that is similar, but is not actually that brand. Kirill: As you work on these productions, who do you work with in your immediate professional vicinity? Gemma: If I’m working there as a graphic artist doing props, it’s with the art director or the set decorator. They contact me and ask me to come and work for them on that particular production. And if it’s something like “Black Mirror”, I work as a separate entity and not through the art department. There it’s more about post-production work, even though I start before the production starts filming. I usually work with the writer, director and production designer. You work through it into the post-production, even after the art department has wrapped. The screens of “Be Right Back” episode of “Black Mirror”. Courtesy of Gemma Kingsley. Kirill: Do you do anything professionally outside the world of feature film and episodic television? Gemma: I work at Sky Sports which is a major sports channel in the UK and Ireland. I do motion graphics for them. Working from production to production takes a lot of hours, and you have a lot of responsibility. I like to take a bit of time out, and work for Sky Sports where I don’t have to work six days a week. I’m finishing a job right now, and then going back to Sky Sports. It allows me to still earn the money while I don’t have to work very long weeks. They allow me to be flexible with my schedule. It allows me to refresh myself until the next big job that comes along. The hours are very long, and it’s a lot of hard work. It’s very rewarding, but very tiring as well. When you finish, you kind of want to rest for a little bit. Kirill: Where do those hours go when you’re working on one of those bigger productions? Gemma: It depends on the job. If I work as a graphic artist in the art department, most of my time is spent in the office. I also go out to the printers to make sure that the prints are exactly the way I wanted them, on the correct paper and with the right look. Sometimes I’ll be on the set, measuring and looking with the set decorator or the production designer. We’ll talk about what it is that they want to put in certain areas, so that I can see what I’m filling. Sometimes, when you’re there, you see what they may not see immediately in my field. On “Black Mirror” I was in my office the majority of time, and then I went on sets to show the actors what it was they were supposed to be doing. They don’t see the final graphics, so they don’t know what it is that they are supposed to be doing. If I’m not there to do that, the raw material ends up costing too much money to fix. The animations that I’m doing on those screens needs to match what the actors are doing, and it makes my job easier and more cost-effective for me to be on set rather than trying to match motions the actors are doing after the fact. We are both on the same page then and it’s choreographed correctly. 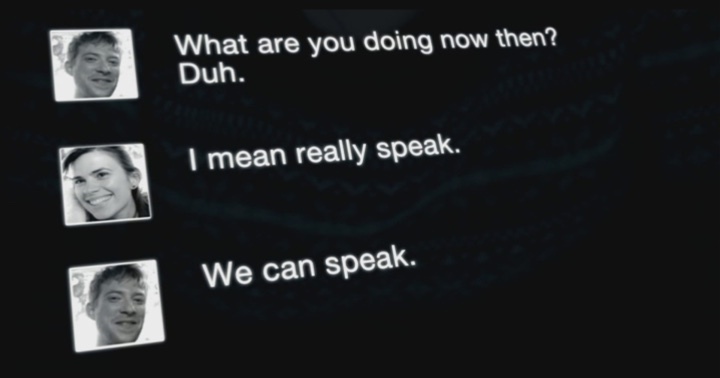 The screens of “The Entire History of You” episode of “Black Mirror”. Courtesy of Gemma Kingsley. Kirill: How did “Black Mirror” start for you? Gemma: The company that I worked with before was approached to do “Black Mirror” by the producers. The company pitched its ideas to the producers, and they agreed that it would work well for them. I got contracted to work on that show, and they wanted me to lead the team that would be doing motion graphics and design. They liked what I did on the first episode, and it went from there. Kirill: You worked on multiple episodes, and every episode tells its own story with its own characters. Does it feel like you’ve been working on one single show? Gemma: No, it doesn’t feel like the same show. They differ in their story lines, but they are all part of the same world. The writer has always been quite adamant of the types of things he wants to see in the show. If you look at the films today, they are very futuristic and advanced. But the exec producers and production designer were in agreement that it shouldn’t be at that level, because we’re not in that world. They wanted it to be now, or perhaps a couple of steps ahead of now. You as a person can imagine this technology actually existing. You could imagine, to a degree, that this could be an alternate reality happening right now. This is unlike a lot of films we’re seeing these days that are very futuristic. You can not imagine people living in that lifestyle day to day right now. 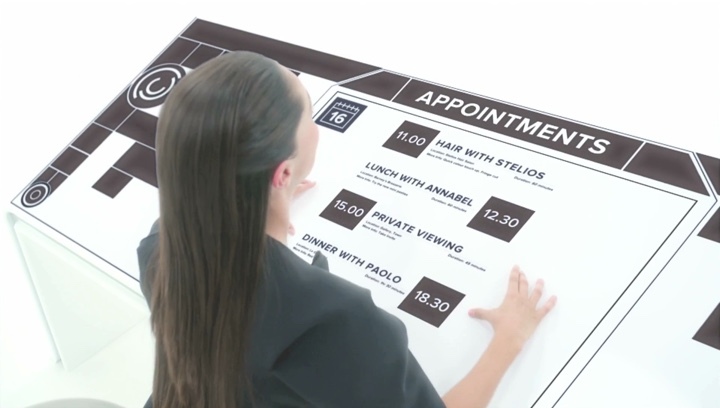 The execs and designer wanted “Black Mirror” to look like we’re living in that reality today. That meant that they wanted a technology of today being in sort of “The Twilight Zone” of the now. These are stories that you can relate to, that you can imagine happening given the opportunity. That’s the feel they wanted to go for. And even though each story line is different, the underlying look is very similar. It’s not too advanced. Kirill: Was that also the direction that you took with the screens of that technology? I’m thinking of the “Be Right Back” episode that shows interfaces for email and messaging, and they are quite utilitarian. They were not calling any attention to themselves. Gemma: And that’s what they wanted them to be like. They didn’t want technology to overtake the story. Some of that technology was made for the show, and they wanted it to have a slightly advanced look in certain areas to have more freedom with what we were doing in post-production. I was contacted by a chap via email, and he asked me where he could find the taxi that we designed for “The Entire History of You.” I designed all the graphics for the taxi, and he wanted to know where to find that, because he liked it and he wanted to use those. He didn’t realize that it was completely fake. The graphics were minimal, but still very advanced, and he thought it was a technology that he could buy and use. That’s the beauty of these things. You can look at it and think that it exists, even if it might be a bit advanced on a plate of glass. The design wanted a simple-looking phone, or a simple-looking computer screen, and the graphics that went on top of those could be as simple or as advanced as we wanted them to. But we wanted to achieve a very “now” feel, with nothing too advanced in it. Kirill: This is what I really liked about the story telling on “Black Mirror”. It’s about the stories and not the technology. Nobody is excited about the technology; it’s a given in that world. It’s about how that technology affects interactions between people. Gemma: The great thing about the writing on the show is how the technology is affecting people now, how social media is taking a huge part in everybody’s life, and how maybe it’s not such a good thing. There’s so much social media, and people are using their phones all the time. And those stories directly reflect that. You can rewind someone’s memories in “The Entire History of You”. You can hit pause and keep rewinding that picture. It’s a reflection of Facebook, really. If you look at someone’s Facebook picture, you can read so many things into it, and it can ruin relationships, potentially. That’s a sort of thing that can be good, but it can also be very terrorizing to a degree. I think that’s what the technology in this show is trying to represent. Technology is very apparent in our everyday lives, and it’s the same on the show. It doesn’t take over the story. There’s still a human factor in it. It’s about how technology is massively changing people’s lives, and how it can be quite bad to a large degree. Kirill: As you were designing the screens, I’d imagine that you didn’t want the screens themselves to be the antagonists. They’re there to show the evolution of our interactions with technology. Gemma. Exactly. The writer has a vision for his writing, and that guides a lot of the decisions for “Black Mirror” and what you see on your screen. I think that for him it would ever be anything that would stand out so much that people would talk about how amazing some of the graphics are. It is always part of the environment it’s in. As a viewer you look at it, and you notice that it’s different from what we use currently. We are not as advanced as that technology, but you can relate to it. 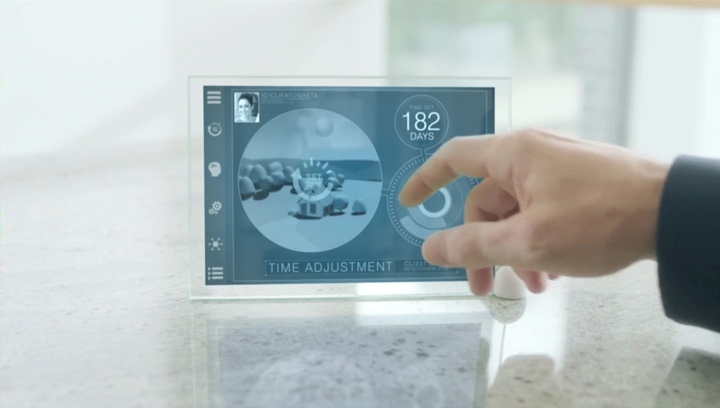 It looks like technology that we can use day to day now. If you look at any film these days, the technology looks incredible. But sometimes it’s so amazing that it overtakes the story. You’re so entrapped by what’s going on and what they’re doing, that you completely miss the point of what it is they’re doing it for. And that is the sort of thinking that we didn’t want. We didn’t want you to miss what was going on in the story. We wanted you to see the technology, but not feel overwhelmed by it. And that’s what we tried to achieve throughout all the episodes. The technology is never supposed to be mind-blowing. You should always be able to relate to it as a viewer. Kirill: You mentioned the interface you did for the taxi sequence on “The Entire History of You”. Would you say that was the most complex screen as far as the amount of detail and the intricacy of graphics? Gemma: Not really. If you look at that show where you have to rewind memories, it wasn’t the most complex. Each episode has very complex areas of its own. Actually the taxi sequence was one of the simpler ones. That scene is not very advanced. 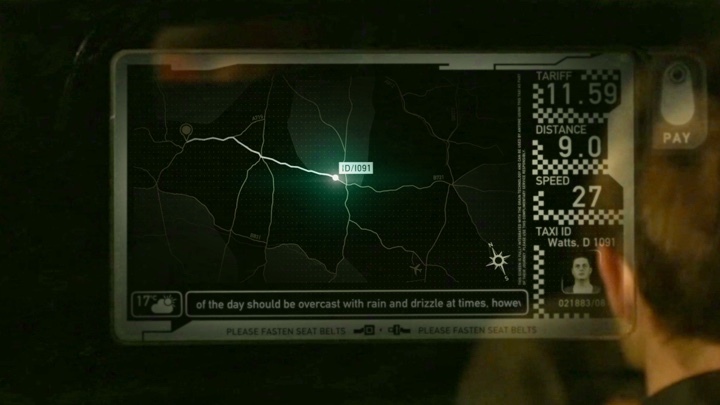 He’s in a taxi with a driver, and when you put a bit of interactive graphics in there with slight movement and animations, it automatically makes the scene much more futuristic, but not that much so. You can still relate to it. You can imagine getting into that taxi now, and that’s why I think I got that email that I mentioned. It looked like the technology was already available, while in fact it was made up. You looked at it and saw something realistic, something that already exists. Kirill: What about the big table interface in “White Christmas”? That was bit further away from this realism that you’re talking about, at least for me. Perhaps it’s because it’s not an interface for a real physical person? Gemma: The script didn’t specifically say what that interface was supposed to look like. 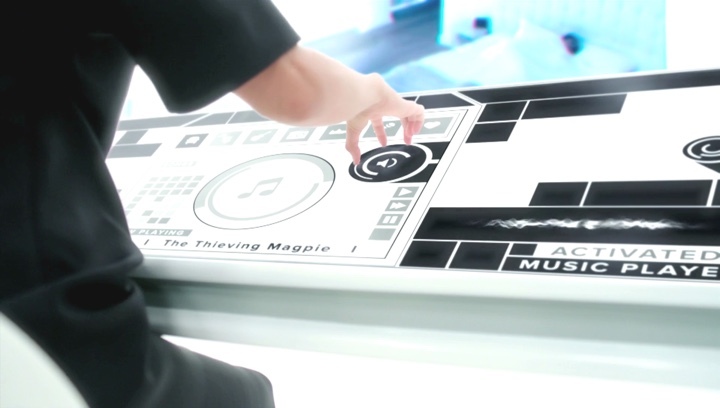 It was at the level of a slightly futuristic table that the character is maneuvering to make things for the real her. We talked about it and we didn’t want it to look like she’s messing around with things in the air. It needed to be something that was in that white room, something that was in front of her as she was sitting there in a space completely void of anything pleasing to the eye. She’s supposed to be this unhappy clone that is not real, and that doesn’t understand that she’s not real. 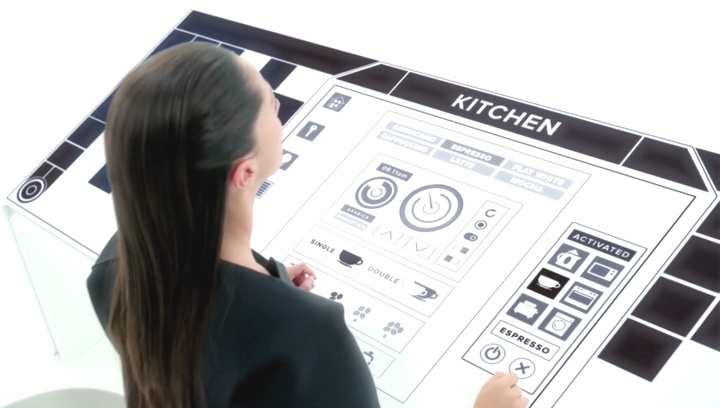 The idea is that this woman in picking and controlling the table so that it would allow the real person to lead a very comfortable life. Again, we wanted the graphics to be something that we can relate to. It was quite difficult to work out what that would be because she is in this alien world, essentially. It couldn’t be anything that you can look at now and sort of relate to. No matter where she pressed on that table, it would be exactly what she needed to press. It never needed labels or explanations on the bottom of what that button does. Whatever she pressed, it would make whatever she wanted to happen, and that’s the beauty of that design. It didn’t really matter where the actress pressed it. She could press top-left and it would be whatever it was for the story – the coffer maker or adjusting the temperature. It meant that we could do whatever we wanted with it, essentially. We looked at a few references of clean designs, and that’s what we tried to have on all the episodes. We wanted to have something clean, something that was not so complex to look at, something that you didn’t have to wrap your head around as a viewer. You don’t understand the whole thing, but you understand what’s happening, and that’s what we were trying to do. Kirill: Was going with a monochromatic palette part of that decision as well for the specific table interface? Gemma: We were going for some color, but we found that it just didn’t work. It looked much nicer that we wanted it to. The white room was very clinical. She looks like very depressed and withdrawn. All she is programmed to do is to press those buttons. So when the colors made that environment more pleasing, that wasn’t what we wanted to do. It almost needed to feel like a factory. She’s going through the motions, and once we added colors to it, it became a happier environment that we didn’t want. Kirill: Would you say that the interface is there to just show that she’s doing something? Because it’s not a big leap to imagining her performing those operations with her mind. Gemma: Exactly. But we needed to show that this person that was made by herself, essentially, to make her own life easier. The way it was written she needed something to make things happen. It allowed her to understand what it was that she was doing as her job. If she just did it with nothing but her brain for instance then she would have nothing to feed off, nothing for us to feed off as the viewer.. She needed something to interact with in order for things to happen. I think that was the idea of the story. It’s almost like someone going to work every day and hating their job. They still have to do that for things to happen, regardless of whether they want to do it or not. They’re getting up to go to work every day to fulfill that job. I think that was the point of that. They needed her to interact with something in order for you as a viewer to understand that story line. Kirill: On “15 Million Merits” you had a lot of work doing motion graphics on all the walls. Was that done in post-production, or were those gigantic LCD screens everywhere? Gemma: On that episode we wanted to capture everything in camera. We had to prepare all the graphics a few months beforehand. We worked out all the sets that we were going to have, and we worked out where the actors were going to be. Then we created interactive graphics and animations for the leading actors. The background graphics were not interactive. They looked like they were controlled, but they were just animations that played on the loop. But for the lead actors we had somebody watching from behind the camera, pressing a button to make something happen. 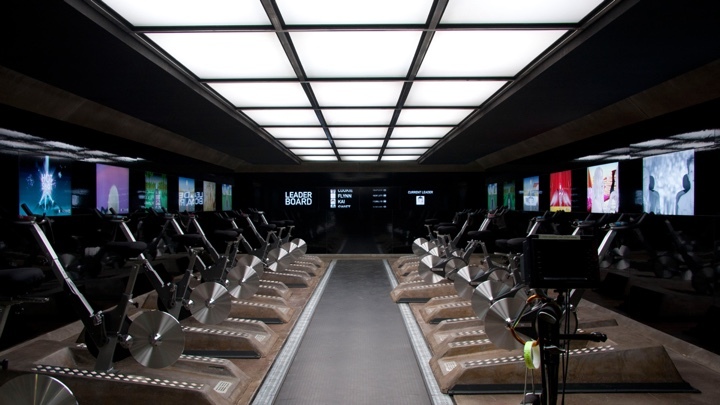 The screens of “15 Million Merits” episode of “Black Mirror”. Courtesy of Gemma Kingsley. Kirill: What was the artistic process to define the visual language for the graphics on that episode? They had a lot of vibrant colors and garish shapes, and an overall look that wasn’t very high-end. Gemma: The designer on that was Daniel May. They wanted it to be more game-like. All that the people were doing on the day to day basis was to try to rack up points. In theory it’s very similar to people playing games. When you’re going to work, you’re essentially play games. It might not be a fun game, but it’s still a game in a sense. You’re watching TV, and you’re bombarded with ads. So the idea was to have a cartoony feel of what it was like to be in front of those screens every day, to play that game to gain points to make your lifestyle better. Kirill: Were you surprised to see people’s reactions to the episodes? Up until Netflix has picked it up for the third season, the episodes were few and far between, and it might have been harder to build a momentum. Gemma: Not really no. Once it went over to US, it did pretty well, winning an international Emmy for best TV mini-series in 2012. I think that’s why Netflix has picked it up. Originally it was on Channel 4 here in the UK and so once it went worldwide, then it took off. It’s nothing like an American show that you’ve seen really. I think that’s why it took off so well. There’s nothing like it. A lot of the shows are very similar, with one story line very similar to the next. But “Black Mirror” is very different. And because we were on Channel 4, it was going to take some time for people to pick up on it. Once the word got out and people started watching it, it took off. It surprised me that it did so well because it’s very different. You have your shows about detectives and aliens and others, and they are very similar to what was done before. But there isn’t anything like “Black Mirror” out there. Kirill: It feels like the world is getting so much smaller in the last decade or so, at least from the cultural perspective where technology is making it so much easier for stories to cross borders. And at least for me, the story lines on all the episodes so far were pretty universal and not confined to any particular country of origin. Gemma: And that’s what they wanted to do. There’s nothing directly relating any episode to the UK or anywhere else. They did it on purpose. They didn’t want it to look like any specific place. They wanted it to be in this twilight zone that doesn’t exist, an alternate reality essentially. Kirill: Does the show make you anxious about our near-time future as a human society? Gemma: I’m not on any social media, purely for that reason. Social media has its benefits, but I don’t think it’s necessarily a good thing. People get wrapped up in it too much, what everyone else thinks and how it should look to everyone else. People post it on Facebook and track how many likes they got. There’s so much emphasis on who’s saying what about who, and you stop doing what you want to do. Essentially it’s what other people think about it. I’ll go on the train, and everybody is sitting there looking at their phones. No one is really interacting with each other anymore. That’s a bit scary to me. You go to a restaurant, and a lot of people are playing with their phones. I don’t know how it will look like in 15-20 years. You see ten-year olds on their phones and social media. It’s crazy. There’s a lot of information, and it can mess with people’s minds if you’re not a strong individual. I think social media can do that to you. Kirill: Everybody is on their phones on the train, but it used to be books and newspapers a couple of decades ago. It’s not like trains were these party places where everybody was talking to everybody. Gemma: That’s true. It’s just that, for instance, a lot of my friends will talk about what just happened on Facebook and who thinks what about what. We came out of Brexit a few weeks ago, and I came to work and so many people were talking about it. Some people were saying there was so much uproar on Facebook because of it, people telling others that they were wrong for voting in or out. And I haven’t heard anything about it because I’m not on Facebook. I decided how I wanted to vote regardless of what anyone thought. That was the difference. Everyone kept on hearing that they were wrong for voting a certain way, and I quite liked the way that I wasn’t swayed by anyone else’s opinion. It was quite nice to have made a decision for myself. I read up on things, and I liked that social media haven’t swayed my decision either way. But I found that a lot of people’s decisions have been swayed by what everyone else thought. There’s so much information out there, and a lot of people don’t know what that information is. People get swayed very easily on social media. Kirill: It is interesting because on one hand it’s so much easier to access almost any information on the Internet, but on the other hand it’s also so much easier to stay within your own echo bubble. There is so much information, and it makes it very “safe” to stay within a group that reinforces your existing opinions. Gemma: People ask me why I don’t post on Facebook so they can look at my holiday pictures. And I tell them that if they want to see them, they should come over and I’ll show them. People prefer to look at pictures on Facebook instead of giving you a call or visiting you. You don’t ever speak, and communication can be quite lost. It’s good that you can see each other’s pictures, but a lot of communication is lost. You don’t call anybody anymore because you saw their pictures last week and you know what they are up to. Face-to-face interaction is lost a lot more now. You don’t really need to anymore, because that information is right in front of you. You don’t need to talk to people. Kirill: Do you think it’s realistic to expect things to go back to what they used to? Technology is not stopping, and it’s bringing so much change to our lives. Gemma: I think it will advance more and more. I don’t think it should go back. I just think people should be a bit more aware that it can change your life. You can be so preoccupied with checking things on Facebook instead of giving somebody a phone call. It’s more about people’s awareness. It’s got a lot of benefits, but it can also overtake what life is. You can read anything into a picture you see on social media. You need to be aware that may be it is too much. Instead of checking people out on Facebook or Instagram, give them a phone call. I don’t think that will happen, though. It will get further into text messaging and social media, instead of calling or visiting. Kirill: Is there any technology on “Black Mirror” that you would want to have in your life? Gemma: That’s a tough one. 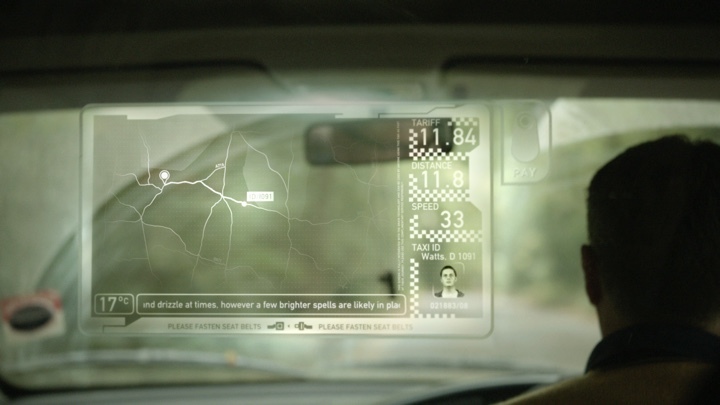 The great thing about “Black Mirror” is that they show you the other side of it. When you start watching an episode, you feel great about the technology. You can rewind events and advance to any moment on “The Entire History of You”, and that would be amazing. You could rewind a memory that made you feel great. And on “Be Right Back” when someone dies, you can recreate them and have them in your life. But on the flip side of that, they are not really that person. You’re stuck with this thing that is not real, and you wanted that real person to be with you. And the same thing on “The Entire History of You” when you see a vision of something, and you’re happy about it. But that entire story is about a couple where he thinks he sees something that is a lot more deeper than it actually is. He ruined his relationship because he looked at that memory over and over, and the more he looked at it, the more he read into it. You can rewind your memories, but at the same time, if you get stuck on something you can’t let go of, then it’s not good. I don’t think there’s a technology from that show that I would want to have. Kirill: What about that home assistant technology? If you ignore for a second that there’s a clone of yourself stuck in her personal hell, wouldn’t you like to have a technology that knows exactly what you want in your home? Gemma: Yes, I would. However, it would make me lazier, to be honest. If I have someone doing everything for me, it would be very nice, but I would become lazier. Because of that I don’t think it would be a good idea for me. I like pushing and challenging myself, and if I had something always making sure everything was perfect for me, it would never push me to be better. 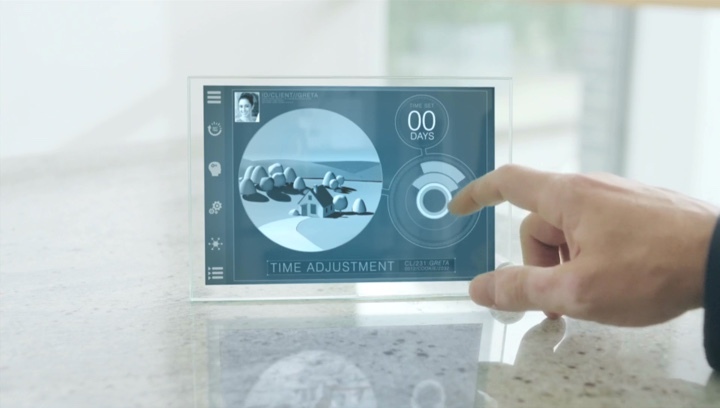 Kirill: What do you think about how fast technology evolves around us in our daily lives? Gemma: I think it’s probably more advanced than we really know, especially in government or private firms utilising it for safety of the country or their own gain in some way. I think we could probably advance more given the money and time, but that’s what life is really all about, time and money – which is what is always the restriction. And here I’d like to thank Gemma Kingsley for taking the time out of her busy schedule to talk with me about the screen graphics and the technology of “Black Mirror”. You can find the first two seasons (and the special) on Amazon, and third season should grace our screens later this year courtesy of Netflix. Finally, if you want to know more about the wonderful world of screen graphics and user interfaces for film and TV, click here for additional in-depth interviews in this series.